Though Thakoon Panichgul has been a fixture on the New York fashion scene for more than a decade, the Thai-American designer had yet to open a bricks-and-mortar store of his own. He decided to do things the other way around. This summer, Panichgul launched his e-commerce platform, before opening his flagship on Wooster Street at the end of August, expanding his business model into a multi-channel experience. The store gives his customers access to an inventory that – importantly for today’s supersonic speed of change in fashion – introduces new collections each season, in limited quantities every two weeks. The retail space, much like the business’ practices, is lucid and seamless. SHoP Architects conceived the store according to the Panichgul aesthetic of modern American sportswear with a timeless simplicity. ‘We played with deceptively simple materials,’ say SHoP, referring to the timber structure of raw American white oak that’s the first thing to catch the eye upon entry. Panichgul and SHoP called upon Brooklyn-based Fernando Mastrangelo for the lightly coloured fittings that form the changing areas, made of concrete poured in layers and redolent of geological strata. Fellow Brooklynites Vonnegut/Kraft, meanwhile, were called in to create a series of woven leather seating pieces. ‘The store is a break from retail precedents, and an intentional reduction of visual anxieties commonly found in retail design,’ states SHoP. London-based Cypriot Michael Anastassiades’ atmospheric style only helps to soothe big city stresses, through the spherical double-height lighting of his signature. One might say that New York’s Soho is crawling with similar projects: historical renovations, cast iron, and floor-to-ceiling windows. 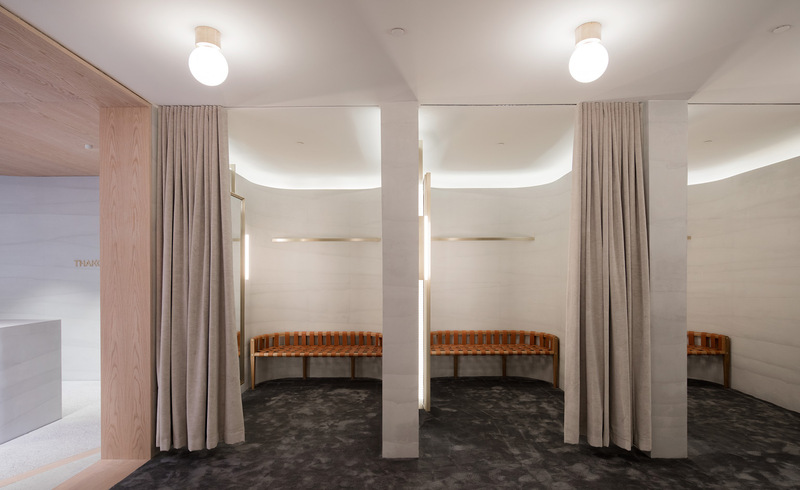 Yet Panichgul’s gentle and intensely collaborative approach pulls the flagship together, revealing Thakoon’s serenity within dynamic New York roots.